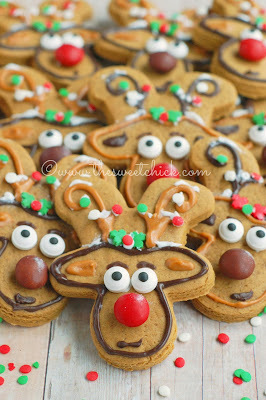 I did not have a go-to recipe for cut out gingerbread men cookies, so I use Brown Eyed Baker's recipe. It made 30 cookies. I even used the same plastic cookie cutter from the Wilton 101 Cookie Cutter set. 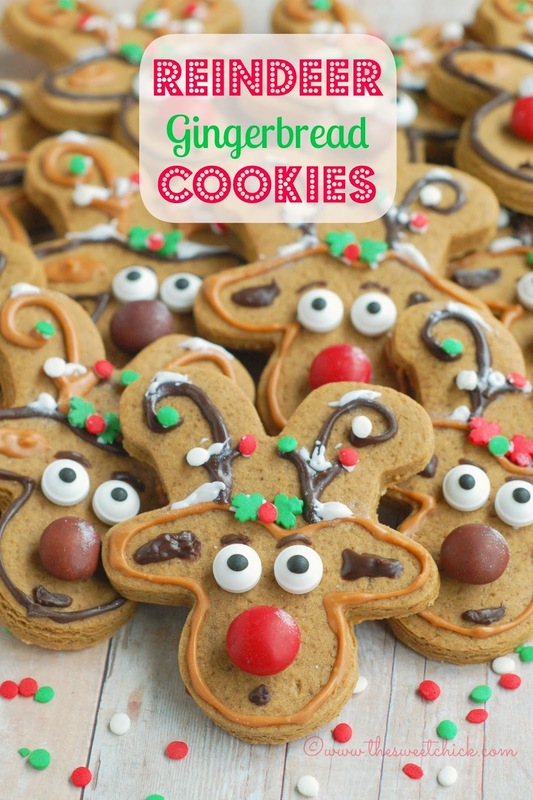 But you can use the Betty Crocker Gingerbread Cookie mix. I have used it before and it is very good. For the outline I used the Wilton Gingerbread Candy Melt I had leftover from my Eggnog Cheesecake Truffles and also some Dark Cocoa candy melt. 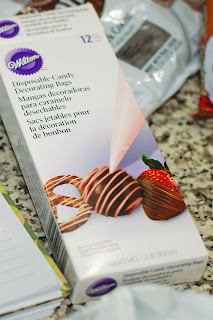 If you add a little vegetable shortening to the melted candy it is easier to use in a piping bag. I did use a #3 tip to do the piping, but if you cut a small enough hole in the piping bag you won't need a tip. I used a toothpick dipped in candy melt to do the eyebrows. 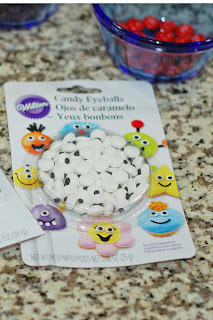 Wilton has so many fun products like these candy eyes. I found them at Walmart, but I have also seen them in craft stores. They just makes this project easier. For the noses, I ended up using red and brown Gingerbread M&Ms because they were larger and made for a funnier nose, but you can use regular M&Ms also. To decorate the antlers with "ornaments" I used holiday sequin sprinkles. And for the "mistletoe" I used green maple leaves from my autumn sprinkle mix. I used Betty Crocker Cookie Icing in white as my glue for the sprinkles, M&Ms, and eyes. Toothpicks were also handy here to place the little sprinkles. I also used the cookie icing to add "snow" to the antlers. After the icing dried I brush on some Wilton Silver Pearl Dust to make the "snow" shimmer. I made a few slight variations on some of the cookies, like switching the dark cocoa candy melt for the gingerbread candy melt, using red maple leaves instead of the green ones, and changing the shapes of the mouths. You can make them any way you want. It's about having fun! Place gingerbread men upside down (heads facing down) on wax paper or parchment paper. Starting with one color at a time, melt candy melt as per instructions on the back of the package. Then place in candy decorating bag and snip off the tip. Begin outlining the face and ears of the reindeer. If you are using the light brown candy melt for this, then prepare another decorating bag with the dark brown candy melt and add your antler design, inner ears, and mouth. Use a toothpick dipped in the dark brown candy melt to add the eyebrows. If you used dark brown as your face outline use the light brown to add the antlers and inner ear. Then let candy melt harden. Once candy melt has harden, dab a little cookie icing on the back of the M&Ms and place them on the cookie, above the mouth. Next, dab some cookie icing on the candy eyes and add them to the face above the M&M noses. 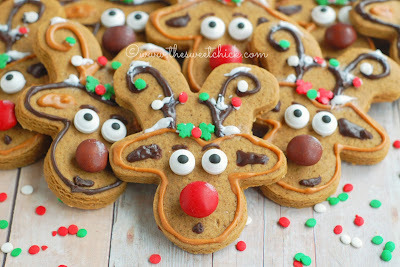 Dab the backs of the green leaves with cookie icing and add them at the top of the reindeer head, between the antlers. Then dab a red sequin and add in to the center of the greens leaves to make the mistletoe. Using cookie icing again as your glue, add different colored sequins to the antlers to look like ornaments. Use a toothpick to help you place them neatly. Finally, dab some cookie icing on the antlers and the top of the head for some snow effect. If you have Pearl Dust, brush some on the "snow" for some extra shimmer and a little bit on the M&M nose. Let everything dry before moving the cookies to an airtight container. If you do use a metal cake decorating tip for the piping, you have to work fast because the candy melt may harden in the tip and you won't be able to place the bag with the tip in the microwave to re-melt it. So cute!! 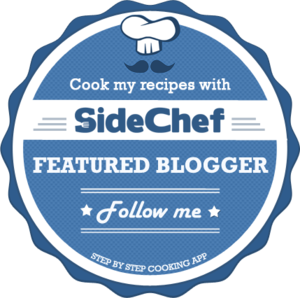 So creative to use an upside down gingerbread!